Directions (1 – 5): Study the following information carefully and answer the following questions. 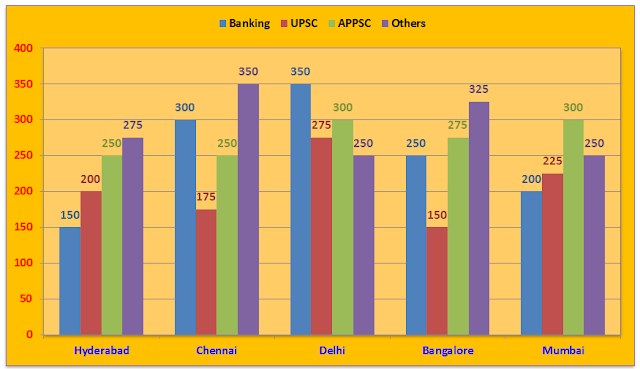 The following bar chart shows the number of different types of coaching institutes from five different cities during 2016. 1. What is the average number of UPSC coaching institutes taken all the cities together? 2. What is the ratio between the total institutes in Mumbai and total institutes in Chennai? 3. In the year 2017, 20% more UPSC and 30% more banking institutes are started while APPSC and others remaining the same, then what is the average number of coaching institutes in 2017 taken all the cities together? 4. Total number of institutes in Bangalore is approximately what percentage more or less than the total number of institutes in Delhi? 5. 20% others institute in Hyderabad is TET coaching institute, then the total TET institute in Hyderabad is what percentage of total institutes in Hyderabad taken together? Directions (6 – 10): What value should come in place of question mark (?) in the following equations? 6. (1/7 of 98) × 14% of 452 + 12 = ? 8. 24 × √576 – 1154 = 34^2 ÷ ? 10. (96 × √6561) ÷ ∛(729) = 36% of ? 10. D) (96×√6561)÷∛729=36% of ?